1credit: Break up to 2 sentry subroutines. 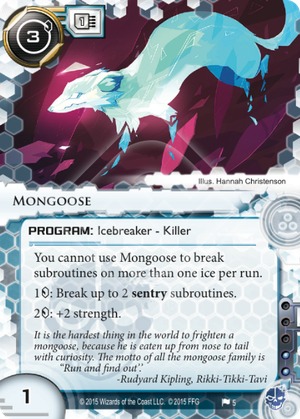 If the Runner uses Mongoose to break subroutines on a piece of ice, and then that ice is encountered a second time during the run (through Cell Portal or The The Twins, for example) can the Runner still break its subroutines with Mongoose? Yes. It is the same copy of the ice, so the Runner can break subroutines on it. Early game, I have money, I have 1 or more breakers in hand but no Faerie. Often I have a Special Order too. As crim you want early aggression, but also, with limited or no recursion you don't want to take Net damage and lose your precious breakers in hand. Or install the breakers then fear running because of Destroyers. In the past I would draw hoping to see a Faerie, often just drawing cards I don't want to see and discarding them (like Emergency Shutdown). I could Special Order for a Faerie but that never feels good. But now I can Special Order for a Mongoose! In this case Mongoose is a filler breaker, it lets you poke and put pressure on early. All while stopping you from wasting your Faeries on low strength Sentries. When you then put down a Faerie you can break things ultra efficiently. In short, it fills a nice spot that needs filled! "The motto of all the #Mongoose family is "Run and find out"
Beautiful flavour for what looks to be a very nice little breaker for the aggressive runner. Two influence will see it see play out of faction but will naturally see most play in aggressive Criminals. My current crim deck uses a pair of Faerie and a Garrote as the solution to sentries. Three creds to completely break Architect, five to break Data Raven and eight to break Archer puts it on on good footing with Garrote which is superb value. It also makes light work of Komainu but falters somewhat against Cortex Lock. The downside is of course you can only use it once per run but for early pressure it is a superb breaker. In a deck playing Faerie and a more expensive breaker, there is an argument to be made for Mongoose replacing either the Faeries or the more expensive breaker. I think the former is a better option right now. It's perfect for those early game forays into enemy servers and can be overwritten once a long-term breaker can replace it. If you're playing in Criminal, you could even stay in faction and add Breach and Peacock to get around Wraparound and Turing, completing your anti-AI-hate suite. Alternatively, it can serve as a partner for Femme Fatale, which struggles with playing it early (too expensive) and breaking big sentries (too inefficient.) Mongoose to the rescue! Oh, and they stack. Afraid of 2 Sentries on a server? 2 Mongooses! I have a feeling stacking sentries, (especially against criminals), is going to become a somewhat common practice, and quickly. At only 2 influence, this is a pretty easy splash, especially if you're packing something else to take care of any stacked sentries, like an AI or the soon-to-be-tested-everywhere Panchatantra + Gingerbread/Deus X/Sharpshooter/whatever. One interesting note, it IS possible to use a single copy of Mongoose on multiple sentries on a run, if you're willing to pull some slightly gnarly jank to do it. Trash it mid-run either by installing another program at instant-speed, or with something like Heartbeat. Then re-install it with a Clone Chip. Since the game considers it to be a "new" install of Mongoose, you can then break another sentry.